Since February 13, I have been in a pattern of alternating between gains and losses. For the last 13 weeks the pattern has held. Today, the pattern is broken. This morning I weighed-in at 221.8 pounds. That is a 0.8 pound loss from last week, and brings my total weight loss to 123.2 pounds or 35.7% of my original body weight. I am very happy with this progress. I have been preaching the mantra that Slow Progress IS PROGRESS to anyone who will listen, and doing my best to live by it. For the past 13 weeks I am down 9 pounds, which works out to an average of 0.7 pounds per week. That is a pace of 36 pounds for a year, which anyone would claim as success! 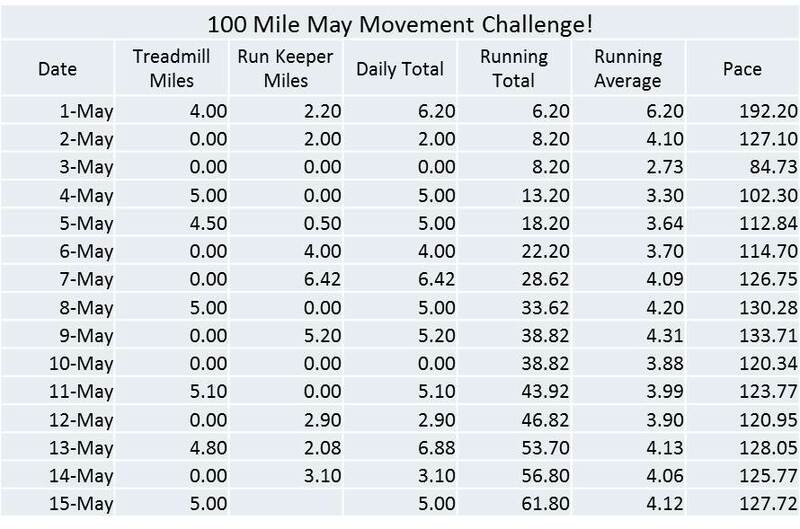 Today is approximately the half way point of the month, and to date I am at 61.8 miles. For the week ahead there will be a few things to note. First, my weigh-in for next week will be a day early. My wife and I are taking a trip to Michigan’s Upper Peninsula for the Memorial Day weekend. We plan to do some hiking there. Second, I may have some really exciting changes to my routine. Some friends here locally have been suggesting that I try Zumba. A group is getting together next Wednesday night, and I am being encouraged to come along. Personally, I think I am far too uncoordinated to pull this off, but I will give it a try. And that will be the night before my weigh-in, so I may have some interesting news. How are you doing with your challenges and goals? What steps do you need to take to shake things up if you are stalled? I’m excited to see that you’re continuing to make progress! … on your overall weight loss goal and May Challenge. Do you realize how close you are to the 100s? Enjoy Zumba – regardless of your coordination level. Remember that any kind of movement is exercise!!! Yay, Bobby!!! Congrats on breaking the cycle!! When I read about your progress, it’s as exciting for me as my own accomplishments 😊 have a great weekend, and have fun at Zumba! Thank you, Alison! Yes, Zumba is going to be interesting. Congrats and let us know how Zumba was for you.